Waivers for minimum school year. The July 26, 2010 meeting of the Worthington Board of Education had an agenda item where the board requested a waiver from the Ohio Department of Education for the ability to hold classes at the middle schools for 177 days next year, rather than the 178 days required by the Ohio Revised Code (ORC 3313.48). I relunctantly voted with the majority to request the waiver after hearing from three of our middle school principals. Why did we need to request a waiver? Ohio law requires school to be in session for 182 days but also specifies that up to 4 half days (or two full days) can be used for PTA conferences and record keeping, thus reducing the minimum to 180 days. The ORC further specifies that an additional 2 days can be used for teacher's professional development, thus reducing the minimum under Ohio law to 178 days. There are 3 additional days that are not accounted for in the contract, one for professional development and two for PTA conferences. 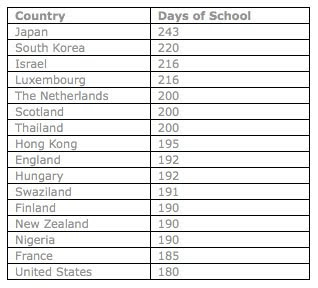 That leaves the minimum 178 days for student contact time. The argument made by the middle school principals is that the 7 days already included in the teacher contract but without classes being in session were not sufficient for the specific professional development activities required to assure the success of our middle school restructure. They further stated that they could not request the teachers attend sessions outside of the contract year (even if we paid them) and therefore, the only alternative was to request the waiver and provide an eighth day under the contract without student contact. At the meeting, I asked if teachers could possibly use the Professional Collaboration Time that is already specified in the contract for this purpose, but again, that time was already spoken for. Both President Obama and Governor Strickland have argued for a longer school year, however, most teachers unions will not agree to this without additional compensation and federal, state and school district budgets would not be able to absorb this additional cost. My objection to the waiver is that we make a bad situation worse by further shortening the school year. Ultimately, our board did approve the waiver. While I had reservations, the unanimous backing of our middle school principals and our superintendent carry a lot of weight, but in the future, I'm hoping that we can work on other ways of allowing teachers the time they need to analyze student data without detracting from student contact time and within the constraints placed upon us by union contracts or, if teachers consent, to add a day or two to the teacher work year to dedicate to activities such as this. For my introductory blog post, I wanted to comment on the plans in congress to defund part of "Race to the Top" in favor of a giveaway to the states to save teaching jobs. In particular, Ohio will get access to RttT funds based on our willingness to implement the components specified in this application. In general, the President believes that we should ease limitations on charter schools, look for innovation in how teachers are paid and evaluated, develop common standards and assessments and expand the use of data (particularly long term data) in evaluating teacher, school and district effectiveness. Sometimes, it seems that any attempt to objectively assess teacher performance and use such assessment to inform compensation and retention decisions is unacceptable to the National Education Association, which is why they issued a vote of "no confidence" for RttT. It is obviously inappropriate to measure a teacher's effectiveness solely based on test scores, but the RttT initiative is designed to figure out what works - and what might get the consent of the unions. I was disappointed in NEA's decision not to embrace the administration's initiative as there is no serious argument that can be made that the optimal way to pay teachers is using the sole criteria of longevity and degrees earned, two items which study after study have shown have little or no impact on a teacher's ability to get the job done. Still, despite the NEA opposition, about 50% of Ohio's districts have signed on to such reforms. Why? Because the federal government is offering a boatload of money for districts who commit to implementation. How much money? Around 4,500,000,000 (4.5 Billion dollars) will be available and most of that will funnel down to individual school districts. In Worthington, we stand to gain around $500K over a 4 year period to do things we probably would have done anyway. Now, along comes Rep. David Obey (D-Wisconsin). Rep. Obey is concerned that states may have to lay off teachers because of rapidly deteriorating state budgets so he inserted a provision into a war spending bill that would give 10,000,000,000 (10 billion) dollars to the states with absolutely no strings attached, no requirement for reform and no need to implement any of the President's education agenda. Rep. Obey decided to pay for some of that 10 Billion Dollars by reducing the amount of the RttT initiative. To recap, President Obama proposes spending 4.5 Billion Dollars in competitive grants to get states to implement much needed education reforms. States like Ohio and districts like Worthington engage with their unions and agree on a blueprint for implementation. Ohio submits a grant application and will in all likelihood get the grant. Rep. Obey and other congressional democrats then decide to offer twice the amount without requiring the reforms. It is as if you try to get your kid to do her homework by offering her a trip to Zoombezi bay and then, an hour later, telling her to forget the homework and Zoombezi bay, you're going to Disneyland! I think Rep. Obey is being short sighted. He is willing to trade an important education reform initiative for a one year delay in state governments having to make the structural changes that are required to balance their budgets. That's not a very good trade. Race to the Top is an important step in the right direction. Rep. Obey and the House Democrats should leave it alone.